Grass pavers are used in both commercial and residential applications and provide a firm surface for vehicular traffic over grassy areas. Common applications are driveways, fire lanes, roads and parking lots. 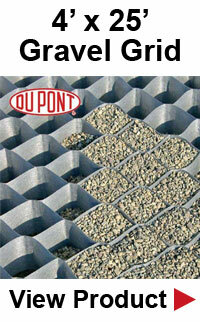 Our grass pavers are manufactured by NDS, a global leader in permeable paver material. 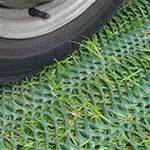 Grass protection mesh provide dependable protection for grassy areas which experience high pedestrian or moderate vehicle traffic. 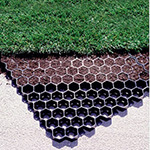 The mesh material can be placed over existing grass and is held in place using u-pins. 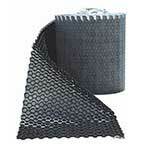 We offer a variety of different sizes and grades to suit any application. Although beautiful and highly practical, bamboo can prove to be a menace if not contained. We offer a wide variety of bamboo barrier to control and contain bamboo rhizomes. Our bamboo barrier is manufactured by Deeproot, the most widely recognized, architect specified and trusted name in bamboo containment. Tree root barrier provides effective containment of tree roots to prevent agains damage to hardscapes and property line intrusion. 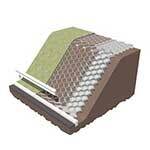 Our tree root barrier provides vertical grooves to force tree roots downward. The downward direction ensures that the tree roots remain strong and deep below the surface to provide prolonged stability of the tree while the roots are contained. 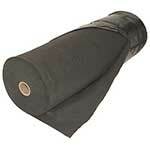 We offer a wide selection of landscape fabric for the professional or homeowner in landscape applications. With grades ranging from 2oz to 8oz our fabric is able to conform to the demands required of a backyard installation through heavy duty commercial and industrial installations. Gravel grid products help to stabilize gravel driveways, parking lots, walkways and equestrian areas from gravel migration and erosion. When building a retaining wall, stability is of the utmost importance. Geogrid greatly helps to stabilize a retaining wall and allows for a taller wall to be safely built than if relying simply on the block's integrity. 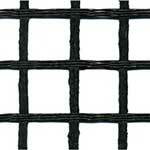 We offer a wide selection of professional-quality geogrid for walls of any size. 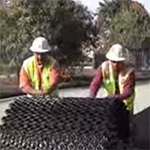 In addition to retaining wall geogrid we also provide roadbase geogrid for stable road construction. 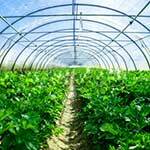 When enclosing a greenhouse it is important to use high-quality polyethylene film which resists dust and tearing. We offer multiple film types to suite nearly any greenhouse application from small residential hobby greenhouses to large commercial growing enclosures. Sand can be one of the most difficult types of land to traverse for people on foot. For wheelchairs and strollers it can be next to impossible. 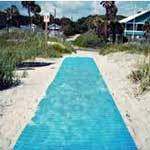 Beach walkway mats create stable, easily accessed surface for everyone. The access mats are available in 5' x 32' rolls which are easily connected and are available in an attractive blue color. GeoCells help to stabilize slopes and flat areas from erosion from ground movement due to erosion, vehicle and foot traffic. 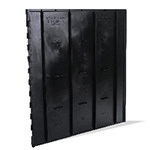 The GeoCell product line is available in different cell sizes and is perfect for both residential and commercial applications. Gopher intrusion can wreak havoc on a lawn often requiring thousands of dollars in repair. Gopher wire helps to protect the lawn from gopher intrusion and is constructed from galvanized steel wire mesh which acts as a barrier between the ground and the grass. When gophers come in contact with the mesh they are discouraged from digging. 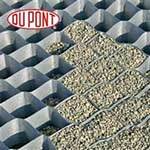 DuPont GroundGrid is a geotextile grid which provides ground stability to areas which are used by either vehicular traffic or heavy pedestrian foot traffic. 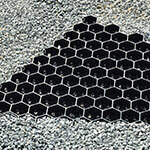 When used in a gravel driveway application, GroundGrid helps to significantly reduce gravel migration by trapping the gravel within the cells. Curb drains can become clogged during times of excessive rainfall with sediment which can cause flooding and environmental damage. 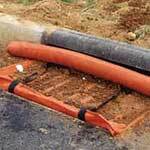 This can be avoided by installing a curb inlet filter which acts as a basket catching sediment and other debris. These inlet filters are available in a wide variety of different sizes and styles to protect any drain from sediment infiltration. 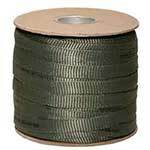 Arbor tie staking and guying material is a flat polyester that is used to tie trees to ensure proper growth. 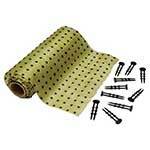 Arbor tie is completely safe for the trees and eliminates tree girding. Arbortie is a low cost economical alternative to traditional staking solutions and is available in a variety of different roll sizes. BioBarrier is a tree root barrier fabric that is equipped with a herbicide which prevents tree root growth into sensitive areas. The built-in nodules release into the soil and discourage tree growth through the barrier while not harming the tree as a whole. 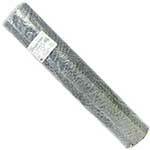 BioBarrier is available in both 20' and 100' roll sizes and in depths from 12" to 58". Block paver sealers help to protect both patio and driveways from damage from ultraviolet rays as well as freezing temperatures and rain. Gravel driveways and parking lots continually experience problems such as rutting and gravel migration due to constant vehicle traffic. Gravel pavers provide a stable surface for gravel areas to resist rutting and provide a more stable and less "mushy" surface. Furthermore, because the gravel is trapped within the cell walls, migration is greatly reduced which greatly increases the lifespan of the area. Many homeowners prefer professional landscape equipment for their home projects. We provide material for "do-it-yourselfers" throughout the United States. Have a question about any of our products? Feel free to give us a call or send us an email. We have extensive product knowledge that we are more than willing to share! We are able to fulfill material orders of any size to locations throughout the United States. Need a written quote? We are more than happy to provide you with a firm written quote for a bid proposal or upcoming project. Additionally, we offer volume discounts for large projects. Please contact us to request a written material quote.